Hard Water? Red Iron Stains? Muddy Water? Acidic Water? Bacteria? Sulfur? 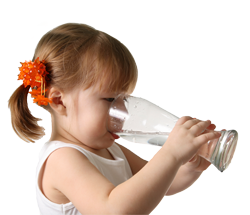 Our state-of-the-art, affordable water treatment services like water treatment repair and water treatment installation & water filtration systems are the solution. Call today to learn more about our water treatment installation services! No Water? Low Water Pressure? Tri-County Pumps specializes in well pump systems and our plumbing professionals can help with your well pump or plumbing services and well pump or plumbing installations. Call today for our well pump, plumbing service! Has it Been 3 – 5 Years Since Your Septic System was Pumped and Cleaned? Need a new septic system installation? Our septic system pumping, cleaning and installation team is fast and reliable. Call Today! We specialize in water well pump systems and well pump installations including sump pumps, laundry tray pumps, hot water tanks & more. Call today for our well plumbing services and our well pump system services! 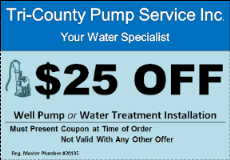 Save on your next well pump or water treatment system, including well plumbing installations with printable coupons or take advantage of our current promotions. Check back for more coupons in the future. 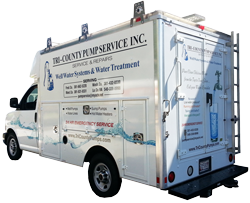 Tri-County Pump Service prides itself with outstanding customer service and highly skilled, well-trained technicians. Our customer’s satisfaction is important to us. Read what other customer’s have to say about our services! 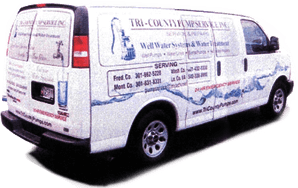 Tri-County Pump Service provides plumbing services, installations, sales and repairs throughout Maryland, Virginia & West Virginia. Tri-County Pumps has been providing customers unbeatable plumbing, water treatment, well pump, and septic service for more than 25 years. Family owned and operated since 1991, we are devoted to providing every customer throughout select Maryland, Virginia, and West Virginia counties the best in high-quality well pump and water treatment services and customer care. We strive to maintain the highest standard in customer service, and to continue creating those long-lasting customer relationships that have been the cornerstone of our success for decades. Through extensive services, an unmatched attention to detail, and an unwavering desire to do every job right the first time, we are your first choice in plumbing quality and dependability. KEEPITFLOWING® with Tri-County Pumps. Complete customer satisfaction is our business. We provide every customer a great experience by consistently delivering outstanding well pump, water treatment, septic services, and plumbing services that won’t break the bank. From water treatment and water filtration system repair and installation, to well pump maintenance, installation, and replacement, our friendly and knowledgeable staff is dedicated to complete, high-quality, and cost-effective services that resolve your problem fast. We pride ourselves on affordable, expert plumbing and water filtration solutions delivered by professionals who are devoted to providing a great customer experience. Our commitment to excellence has even earned us an A+ rating by the BBB! Our expert pump systems and water treatment services are available to customers throughout the surrounding area, including Frederick County, Montgomery County, and Washington County, MD. 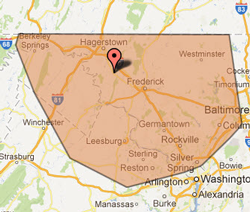 We also provide great services to customers across Loudoun County, VA, and Jefferson and Berkeley Counties in WV. Regardless of where you are, our well-trained plumbing, septic system, and well pump service technicians provide you fast and reliable installations, repair, maintenance, and replacement services you won’t find elsewhere. Whether your well pump system is on the fritz or your tap water has taken a turn for the worst, you can trust us to make it right. Our service, repair, and installation experts know what it takes to get the job done fast, right, and within your budget. We have advanced knowledge of well pump systems, water treatment and water filtration systems, and septic systems, and will go to work immediately to achieved clean water and plumbing solutions needed to be happy and healthy for years to come. If you’re experiencing low water pressure or have no water at all, you may have a problem with your existing well pump system. We provide professional well pump service, installation, and repair to get your system up and running fast. Is your water muddy or acidic? Is it contaminated with bacteria and coliform? Or does it smell like sulfur? Our state-of-the-art water treatment services, including water filtration system repair, service, and installation, may be the answer. If you’ve gone 3 to 5 years since cleaning your septic system, we can help. We provide reliable and fast septic system pumping, cleaning, and installation you can count on. Tri-County is the team to turn to when seeking the best in plumbing services, repair, and installation. We respond quickly and commit ourselves to getting the job done right every time.